Near the seaward end of Loch Carron and sheltered by the loch's deeply indented southern shore lies the picturesque village of Plockton. 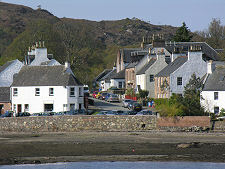 Those choosing the coastal route from Stromeferry to Kyle of Lochalsh via Plockton and nearby Duirinish take longer to reach their destination than those who take the more direct inland road: but the scenery is superb and Plockton is the undisputed highlight of any visit to the area. 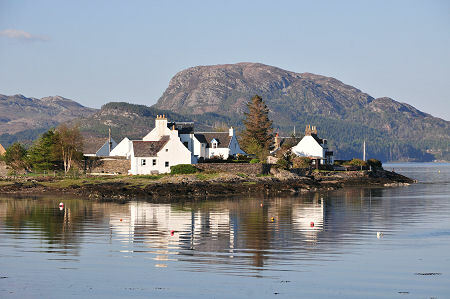 This small lochside village is one of the most attractive in Scotland, an idyllic place in an idyllic setting. A row of neatly painted cottages hugs the shoreline following the curve of the tiny harbour. Palm trees line the main street and the whole scene is framed by a landscape of islands, heather and pine. Across the harbour the views are of white cottages on a craggy point, with the mountains of Wester Ross in the background. 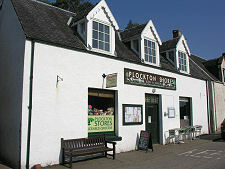 It comes as no surprise to find that Plockton is a haven for artists. In the early 1800s the landlord, Sir Hugh Innes, decided he could increase the value of his estates further by giving tenants cleared from inland areas an alternative to emigration: instead they could resettle in a new fishing port he developed under the name of "Plocktown". 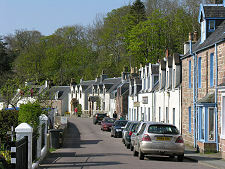 New streets of houses were built, many with small crofts, pieces of land that the residents could use to supplement the income they derived from fishing. This was the era of the "herring boom" and Plockton rapidly grew to accommodate over 500 people, many living two families to a cottage. But the herring boom simply ended when the fish changed their migration patterns, and the area was also severely affected by the potato famine of the late 1840s. 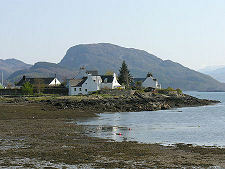 Before long Plockton became known as Baile na Bochdainn, or "village of the poor". It saw a resurgence following the arrival of the railway in the 1890s, but large scale fishing never resumed. Today you can still find a few prawn or lobster fishermen operating from the new pier near the north end of the village. Plockton today is a lively place. Its presence on the tourist map was firmly established when, in the mid-1990s, the BBC chose to film a drama series called Hamish Macbeth here. Three series were made and tourists flocked to see its setting. Though the TV effect has diminished, it's no longer necessary and summers remain very busy here. 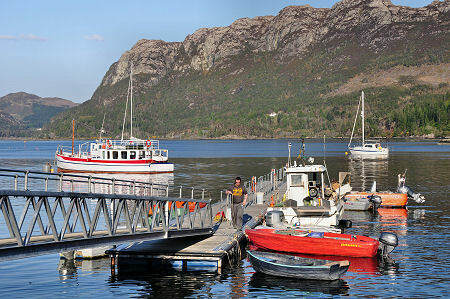 Today the highlight of the year is the annual Plockton Regatta, held for a fortnight starting at the end of July. 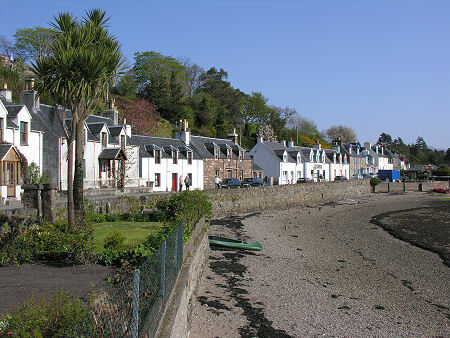 For those wishing to stay awhile, Plockton has a number of good hotels, guest houses and bed and breakfast establishments and there is a wide choice of self-catering. There are also plenty of places to eat and drink. 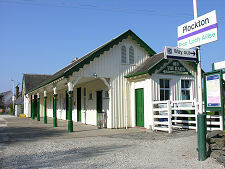 The village has a few shops and a post office: plus a railway station on the Inverness to Kyle of Lochalsh line and a small airfield. Things to do include summer boat trips. 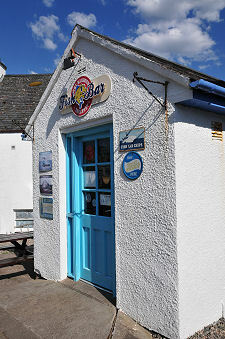 These are advertised by the harbour and available for fishing or seal spotting. During the busiest months pleasure trips depart several times a day. Craig Highland Farm, midway between Plockton and Stromeferry, has ancient breeds of Scottish farm animals as well as llamas and peacocks. Also close by is Lochalsh Woodland Garden. Here visitors are welcome throughout the year. The gardens are pleasantly sheltered and a walk by the lochside reveals new developments as well as many tree specimens over 100 years old. Meanwhile, Kyle of Lochalsh is only some five miles to the south west, and beyond it is the Isle of Skye.